The 024A, manufactured by Met One, is a wind vane that measures wind direction only. 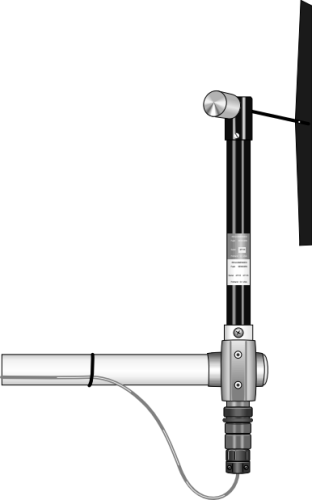 You can use it in tandem with the 014A Wind Speed Sensor; however, this combination has been largely replaced by the 034B, which monitors both wind speed and wind direction. The 024A Wind Vane measures wind direction from 0 to 360 degrees with a 5 degree accuracy specification. Wind direction is sensed with a 10 kohm potentiometer. With the precision excitation voltage from the data logger applied to the potentiometer element, the output signal is an analog voltage that is directly proportional to the azimuth of the wind direction. The 024A can be attached to a crossarm via a 17953 NU-RAIL fitting or a CM220 Right Angle Mounting Bracket. Alternatively, the 024A can be attached to the top of a CM106B or a stainless-steel tripod via the CM216 Sensor Mounting Kit. The CM216 extends 4 in. above the mast of the tripod. The 024A uses one single-ended input channel on the data logger. An excitation channel is required but due to the high impedance of the 024A, can be shared with other high impedance sensors. The 024A is read by the BrHalf instruction in CRBasic and by Instruction 4 (Excite-Delay-Single-ended Measurement) in Edlog. Using Short Cut, click the applicable wind direction sensor in the Selected Sensors list of the Outputs screen. The two output options enabled are Sample and WindVector. Select WindVector. The WindVector instruction has output options. Select an option with mean wind direction in it.